Watering – Sunflowers are generally quite hardy to short dry or wet spells, but of note for the sunflower is the need to check that the sunflower does not get over watered for an extended period. Too much water may result in the soil loosening and becoming far too unstable to support the weight of the sunflower head as it sways in the wind. Planting a larger grouping of sunflowers has the benefit of helping to stabilize the immediate area of soil and in addition, their proximity to each other helps to create some barrier to wind damage. Plus, this will help to hold moisture in the soil, as the sun is quite readily blocked from directly heating the ground by each large plant. Stabilization – Even if the soil is quite hardy there is always a risk of the sunflower tilting over or simply snapping in the wind. If you are concerned, you can stabilize the sunflowers once they are large, especially in a small planting. Put a simple stake into the ground close to the sunflower stem and make sure that it stands strong and stable on its own. Next, you can tie small pieces of thick string, florist ties or velcro around the stake and the sunflower, thus helping them to support each other. You should see to it that the pieces of string do not cut into the stem of the sunflower as it sways in the wind. Having the sunflower cut down by your own stabilization efforts would indeed be unfortunate. Pruning – Now pruning a sunflower, you think, sounds like a questionable idea and you are right – cutting a healthy sunflower is a waste of a sunflower. Typically, sunflowers require absolutely no pruning at all. So how could pruning possibly be a means of improving sunflower care? The following only applies to groups of sunflowers growing together. Because the sunflowers are so sensitive to weight and the forces of nature you should never allow the grouping to be put in jeopardy for a single flower. If a sunflower is leaning against another it is better to cut the least healthy of them down instead of having them bringing each other down, or toppling maybe even more sunflowers in a domino-style event. If the sunflower you have had to prune out of the cluster has a flower head, you can still lay that head out next to a bird feeder or an out-of-the-way spot and nature will find uses for it. 1 Before planting sunflowers, mix manure into the soil where the sunflowers will be growing. Sunflowers do well in most soil conditions, so this is not too much of a worry. However, rocky or sandy conditions will not allow your sunflowers to grow well. 2 Plant sunflowers in an area where they will get the most sun. 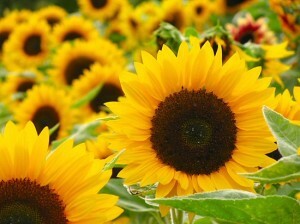 As their name implies, sunflowers thrive in the sunlight, at least six hours of direct sun a day. Sunflowers also lean in towards the sunlight, so remember that if you want them to grow a certain way. They will face their blooms to the rising sun, found in the east. 3 Plant sunflower seeds about one-quarter inch down into the soil. They should also be about 12 inches to 18 inches apart. 4 Water sunflowers daily to help the stems support the heavy weight of the sunflower head. 5 Put sunflowers in a tall pot if you are growing them in planters. 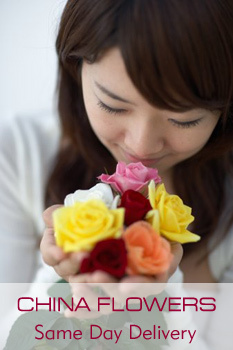 You need to have enough soil and support for the height and weight of the flower. 6 Feed sunflowers regularly with a growing solution, such as Miracle Grow. Avoid pouring the fertilizer right onto the roots, as this can make them rot. Instead, make a few holes, about 3-4 inches deep, around the plant, and pour the fertilizer into the holes. 7 Watch the weather, as heavy winds can cause sunflowers to blow over. If winds are predicted, then do not water that day. It will reduce this risk of the sunflowers blowing over. 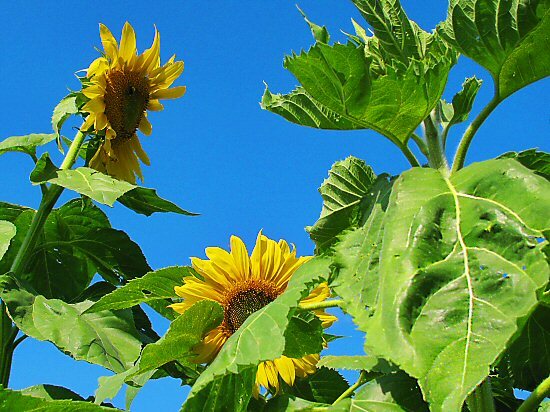 8 Stalking your sunflowers is not a necessity, unless the area is extremely windy or the conditions are too shady. Sunflowers in the shade will lean towards the sun, so it is best to avoid shady areas for these beautiful flowers.